Ask anyone who routinely flexes their green thumb and they’ll happily tell you gardening is one of the most fulfilling hobbies you could have. You gain an immense sense of accomplishment from working the land to produce food for your family coupled with some great exercise outdoors. It doesn’t matter what you grow or how experienced you are, either. Even if your experience with vegetables and fruits begins and ends with eating them, you’re just as capable of building and managing a garden as anyone. In fact, we’ll show you just how easy it can be. Here’s how to start your own garden. A common rule of thumb for starting your own garden is only grow what you’ll eat. If okra makes you gag, maybe leave those seeds on the shelf. Figure out which fruits, veggies, and herbs your family loves most and start there. You’ll have to account for more than taste when figuring out what to grow, though. Just as important to consider is your location. If you’re local to Florida, you’ll have to contend with high humidity and brutal summers. Northern gardeners, meanwhile, will have to pay close attention to frost points throughout the winter. Different plants prefer certain climates, so make sure you select plants that will work for your area. Companion plants or flowers are also a great idea to grow alongside your fruits, veggies, and herbs. Flowers especially are great for attracting bees and other pollinators to help your harvest reach its full growth potential. They can even attract other beneficial insects to help fight pests! One thing to keep in mind throughout this process is to start small! It might seem appealing to turn your backyard into your own personal produce department, but maintaining a large garden takes a lot of work. Plant a small crop for your first go-round, keep it healthy and pest-free, and then you can try expanding next year. Plants need sun, so just set them somewhere they’ll get plenty of UV, right? While it’s true most fruits and veggies require approximately six hours of sunlight each day, too much or too little can ruin their ability to grow. Some plants even do well in partial shade. Just make sure you know what your chosen plants require for optimal growth. It’s best to select an area that’s easily accessible for watering and tending to, as well as an area that’s far from any children’s or pets’ play areas. Natural pests will be trouble enough; it’s best not to add additional factors that can cause trauma to your garden. And most importantly: set up your garden somewhere you can’t forget about it! Out back behind the shed you never use is where gardens go to die, so plant your crop somewhere you’ll see every day. If there’s sod where you want to plant, it’s got to go. You can use a sod-cutting machine or cut it out with a sharp knife for quick results, or you can smother the sod with newspaper and a three-inch layer of compost. This is a longer method (it’ll take about four months for everything to decompose), but it’s also easier. Once you’ve got a spot picked out, start planning your garden bed. How many will you set up? What shape(s) will they be? How big will they be? Generally, you don’t want your beds to be wider than three or four feet – just wide enough that your plants get enough space while still giving you enough room to water and maintain without stepping in the bed. Raised beds are a great idea for many reasons. They look great, provide better yields, help fight against weeds, and more. Raised beds also tend to dry out more easily, so be wary of that. 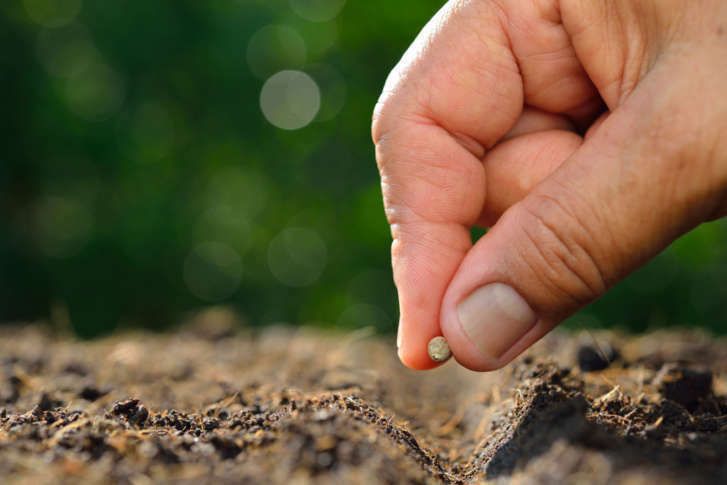 Before you get to planting, you’ll want to pay some attention to your soil. First up, have it tested to learn its acidity, alkalinity, its makeup, and any risks of contamination it may face. You can order tests online or through your county cooperative extension office. You’ll also want to give your soil a little boost before planting. A simple cocktail of organic matter like compost, dry grass clippings, decayed leaves, or old manure can enrich your soil and make it more fertile. To seed or to transplant? It’s time to get planting! Well, after you decide how you’re going to start growing your garden. You can start with seeds that you’ll sow directly into the soil. If you go this route, follow the seeding instructions on the package and you should be fine. Alternatively, you can start with transplants, which are young plants that have already started growing. They’re easier – just dig a hole and drop them in – but not all plants thrive as transplants. Your best bet is to figure out what you want to grow, then do some research online or at your local home and garden store to find out which method best suits that plant. You’ve done it. You’ve tilled the land, dug up the soil, and planted your first batch of fruits, veggies, herbs, flowers, or whatever it is your green heart desires. Now it’s time to nurture them from spritely little seedlings into big, healthy plants. That means you’ll need to water them daily, especially while they’re small. And while your little seedlings and transplants will gulp down a ton of H2O, still be mindful not to overwater them. Once their roots take firm hold in the soil, you can adjust your watering schedule according to your soil, humidity, and how often it rains. If there’s one major defiler of gardens, it’s weeds. Help keep them out (and water in) with a couple inches of mulch. Any kind of mulch will do, whether you choose pine needles, grass clippings, or bark chips. Got any of your own tips and tricks for starting a personal garden? Let us know in the comments below!